Mars has some of the highest mountains in the Solar System, including its highest peak, the shield volcano of Olympus Mons. Mars’s weather is also shaped by dust storms. And it thus should be no surprise that dust storms have been observed on or near these volcanoes for more than a decade. 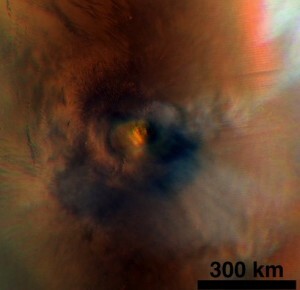 These storms were predicted to bring dust and water vapor to altitudes up to 20 kilometers (12 miles) above the 25 kilometer (16 mile) summit of Olympus Mons and other similar mountains. This trickle of water transport by volcano-based dust storms may be part of the water loss from Mars’s atmosphere today. In a paper published online in Geophysical Research Letters today and recently covered by New Scientist, a team led by Hampton University Research Assistant Professor of Planetary Science, Nicholas G. Heavens, reports the existence of extraordinarily dusty and high altitude haze layers that cluster near Mars’s highest volcanoes. The existence of these layers suggests that volcano-based dust storms on Mars transport dust and water vapor much higher in the atmosphere than previously suspected. In one case, a storm was directly observed that stretched as high as 50 km (30 miles) above the summit of the Martian volcano, Arsia Mons. In addition, the haze layers are rarely observed when dust storms are observed on the volcanoes. This observation suggests that dust storms are short-lived, form late in the morning or early in the afternoon, and therefore are more common than previously suspected. The observations reported in the paper are from two instruments on NASA’s Mars Reconnaissance Orbiter: the Mars Climate Sounder and the Mars Color Imager. The first instrument can observe Mars’s atmosphere in vertical cross-section, while the second instrument is a weather camera that produces images like the satellite images seen on television news program. Studying data from these two instruments has been the subject of two student projects for the APS Department’s summer undergraduate research program. This research was supported by NASA’s Jet Propulsion Laboratory, California Institute of Technology and NASA’s Mars Data Analysis Program. Collaborating authors are from the Jet Propulsion Laboratory and Malin Space Science Systems in San Diego, California.